The Northern Dispensary is held hostage by its convoluted deed--will its owners find a way to put it to use? The Northern Dispensary in Greenwich Village remains abandoned. 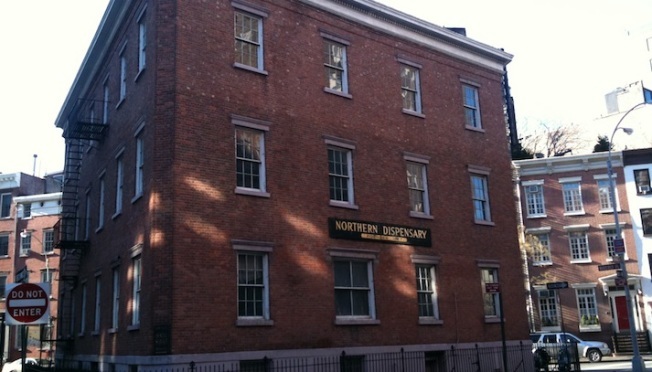 The Northern Dispensary, in the heart of Greenwich Village, seems an ideal location for new condos or residences, but it's remained vacant for years, leaving neighbors wondering why. Turns out, it's complicated. The site's deed holds some tricky restrictions that put its owner, William Gottlieb Real Estate, in a pickle when it comes to finding a solution for the building with potential. The New York Times has tried to uncover the mystery of the building, discovering that the plot must be used, somehow, in a way to aid the sick or others in need. The deed's language might be old, and its intentions speaking to a different New York City, but failing to follow the deed could result in a lawsuit for the owners. ("No obscene performances" allowed--that includes abortions, since the building was once owned by the Catholic Church.) Tricky, tricky, tricky. The owners told the Times they're "aware of the deed restrictions" and that they're "examining our options," which leaves us all wondering what's really going to happen to the historic property.